Plans to further integrate the EU member states together are clashing with the rising tide of anti-EU sentiment across the continent - the latest being Italy, where the Eurosceptics are now forming the government. How will the continental Union come out of this? 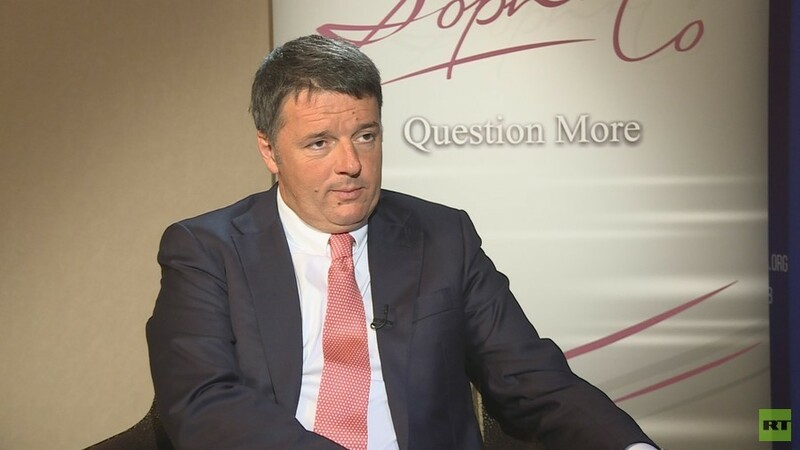 We talked to Matteo Renzi, former prime minister of Italy. Sophie Shevardnadze: Matteo Renzi, it’s really great to have you on our programme. It’s been a long time we’ve been trying to get you as a guest. So it’s amazing that you’re here. Lots to talk about. Italy is about to become the first EU country having a populist government - first in EU. Like, there are attempts in other countries, but it never happened. The two parties that form the coalition that’s going to be in the government represent everything you oppose. What are your thoughts about it? Matteo Renzi: My view is that we need a very good relation between the government and people. But this relation will be based and focused not on the slogans and easy promises but on the results, concrete projects, great opportunities. In Italy the election showed that the country is divided with a victory for two parties which will create a new government. My view is that now it’s time to verify if the promises and slogans of the electoral campaign will be realised in projects and laws day by day. So, I’m the opposition, but I’m really curious. We will see if after a great electoral campaign with great proposals to the citizens those populists will be able to achieve any results. SS: When your party was offered to form a coalition with Five Star Movement, you said it’s ‘absurd’. And now they are forming the government. Probably, the next prime minister will be from the party too. Do you still think it’s absurd? Maybe it was worth it forming the coalition with them? Maybe you could have done great things together? MR: I think, there’s a great difference between Five Star Movement and the Democratic Party. And people voting for Five Star Movement represent a different idea of development for Italy than people voting for the Democratic Party and vice versa. So, if Five Star Movement and the Democratic Party should be able to create a government together nobody in Italy could understand that because we were rivals during the electoral campaign. I think, after the elections the winner makes the government, the loser makes the opposition. The idea of creating the government of rivals is very strange. Now it’s time for Five Star Movement to create a government. Now it’s time for the Democratic Party to make an opposition. I hope and I believe, as soon as it will be possible, very soon in my dreams, in my hopes and in my ideas, we’ll come back. Time will come for us to come back to power to create a government. SS: When you came to power in 2014 it was like this big breath of fresh air - a young man comes after a long period of stagnation. And you said: “I will demolish the establishment”. Do you feel like you were able to do that? SS: Yeah, you’re young. You have time. MR: I’m 44 years old. I hope I have time. SS: So, I mentioned you promising to demolish the establishment because these people who are now in power are also coming to power on anti-establishment slogans. When you look at their ideas they are very radical on paper, and they don’t have majority in the parliament. So, most probably the reforms that they are proposing will undergo checks in the parliament. So whatever you have, the outcome of these reforms is not going to be what they are proposing right now. Do you feel like you come with this anti-establishment sentiment but in the end the system never lets you change things completely? MR: This is a good question for a lot of reasons. The sentiment against the politicians and against the establishment was particularly supported by the social media campaign in the last period of time and by the use of social views which were particularly dark in my view. I’m a great fan of social media. I was one of the first to use Facebook, Twitter and Instagram in my country. I know, in the last years a lot of people and a lot of politicians use the social media not to change the country but to change the citizens, the mindset of citizens, to stress the elements of criticism and scepticism and anger against the politicians and the establishment. It’s normal, but I believe, this is very dangerous. Why? Because if today the populists win the election thanks to this sentiment, anti-establishment became establishment, they risk to have the same reaction and the same impact on the citizens. I believe it’s very important to be honest and pragmatic. There’s a project for Italy and for Europe. Will they be able to respect the promises made to the citizens during the election? This is the point. The people that win the election have a great responsibility. Let me be very clear. For the populists everything is easy until they become a government. For Marine Le Pen in France it’s easy to have the same slogans, the same polemics, the same message, if she was able to win the election. Because today and tomorrow the man called to solve the problems in France is not Marine Le Pen. It’s Emmanuel Macron. It’s very easy for Alternative für Deutschland in Germany to use expressions against migrants, against the establishment, against Angela Merkel because every day and every night Angela Merkel is the woman who has to be able to solve the problems. In Italy the situation now is different because the men and the women with an ability to change things are the populists. And I believe, for the populists everything is easy until they win the election. SS: I’m also very curious to see how long they are going to stay in power. I remember, you proposed a constitutional change. You wanted to streamline the very chaotic Italian government system with 65 governments in 70 years. But Italians didn’t want it. Why is that? MR: Churchill is a totally different thing. But I think, you have to try. This is very important. But in Italy if you try you can win or you can fail. But I think, this battle for a constitutional referendum was correct. But the citizens decided to vote “no” and so now it’s time for other people. We will come back. SS: I just have one question about immigration and I would love to talk to you about the future of the European Union ‘cause I know, you are very outspoken about it. Notoriously anti-migrant Matteo Salvini will probably be interior minister. He thinks, he’s going to kick half a million people out of the country. When you were Prime Minister you were also very tough on refugees and illegal immigration - do you think that’s the way to go? SS: So what would you do right now? SS: It’s a long-time perspective. What about now? People coming to your country - should they be sent back to the sea? MR: In the last period of time the number of migrants has really decreased significantly. Now the situation is absolutely better than in the past. But I believe, Europe is either able to have a common strategy for migration or Europe will lose itself. For that reason we proposed when I was Prime Minister (and I hope, the new government will confirm this approach) a very clear message. Now it’s time for budgets in the European Union. And you know, money is very important for European discussion. My proposal is that: Italy gave every year a lot of money for all the countries - more or less, 20 billion euro. And we received only 12-13 billion every year. So the balance is 6,7,8 billion euro given to the other countries in Europe. In the other countries, particularly, the eastern countries with the most important people who receive money from Italy decided to stop to welcome - more correctly - didn’t start to welcome migrants, ok, we respect this decision. But, please, Italy will stop giving the money. There’s either a solidarity for everything (money, migrants, values) or there’s a solidarity to bring the money and refuse to take in migrants - this is not solidarity. This approach is unacceptable. I hope, the new government will continue this strategy because this strategy is the only strategy for the brief period to help Italy, Greece and other countries manage the migration crisis. SS: So this migration crisis in my opinion is one of the reasons why the eurosceptic movement is so big in Europe. I grew up in France. Back then it would be unthinkable for Marine Le Pen’s father to get platforms or to meet channels to ever be a second runner-up in the presidential campaign. UK is another example. You can be cynical and ironic about it but it’s an undeniable fact that these movements are gaining force. Do you feel like you, the pro-European force, traditional politicians in Europe can gather together and strike back? Or are these forces here to stay forever now on the European landscape? MR: I agree with you. It’s a big difference between France of today and France of yesterday. And the same is about the Brexit referendum if you think about the north of UK. There’s a difference between London and Manchester and Liverpool. But I think, euroscepticism is very different. The number of migrants in France is unbelievable compared to the number of migrants in Italy. It’s not simply migrants that is the cause of euroscepticism. In part it is and in part, I think, it’s the lack of political vision of Europe. This is a very important thing. Europe has an incredible experience of peace and prosperity. After centuries of war, after centuries of civil war in Italy, France, Germany Europe finally became the place of peace and dialogue. But in the last period of time we’ve reduced it to only technical approach, only a technician vision. I think, Europe is the place of global vision for the future. In this way, I believe, it’s absolutely crucial to be able to give a message of change in the political leadership of Europe. SS: What change? Because change is nothing but change, but nothing is changing. MR: It depends because something is different. For example, people of the next generation study together. Erasmus is the latest thing European leaders rely on. Not parameters of Maastricht. Human values, human culture, human civil rights is the part of identity of Europe. So if we continue to discuss only the parameters of Maastricht, Fiscal Compact, Six-Pack, we won’t be able to give the next generation a reason to be proud of being a European. This is the reason of euroscepticism. So we have a lot of problems and issues. Migrants, surely, the lack of employment is one of the most important problems in my country and in Europe in general. Surely, the lack of good relations between some cities and other cities, particularly in the suburbs, surely, this is the part of euroscepticism too. MR: It’s also correct if you think about some countries which are very rich, you will see the rise of euroscepticism. Alternative für Deutschland in Germany with a very good performance in economy - it’s a very strange message. So it’s not only economy. In my country it’s not only a money problem. Because the rich north-east voted for populist parties like Lega Nord. Please, this is the time for Europe to come back to great values, to great vision and to great ideas and ideals. And I believe that it’s possible if the new generation of native Europeans... Because I’m Italian, my passport is Italian and I’m so proud to be Italian but I’m also proud to be a European citizen. The next generation will be the generation that will bring Europe back to the side of values. SS: Matteo Renzi, thank you very much for this interview. All the best of luck with everything. I hope you’ll come back to power and will give us an interview again. MR: Thank you so much! Absolutely! Ciao!